Malygos? Y'Shaarj, Rage Unbound? This thing is strange, but the good kind. So this card is a bit of Barnes and a bit of Shadow Essence. It hints this might be a very annoying card if someone makes it work. 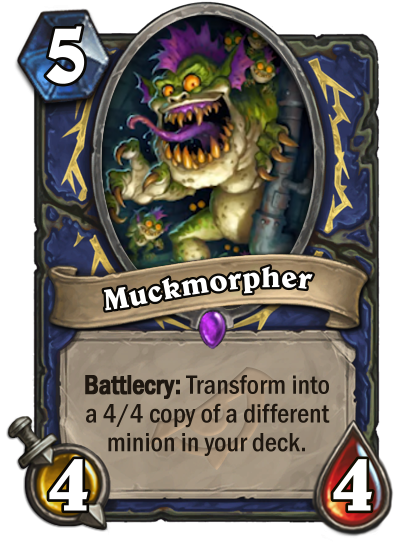 I wonder does Shudderwock wants to play it? Not sure about it. Would you like it to change to random minion from your deck? Would it stop casting like nerfed Yogg-Saron, Hope's End I think it is anti-synergy. I´m sure people will find some OTKish combo stuff with this card. Meanwhile its also very good with the new elemental. LOL Did they seriously introduce a non-legendary Barnes for standard ? Lol, lol, looooool. At least it's not neutral, lol. This is really cool. Something you might try to build around. This is a very different kind of Shaman. Something we haven't really seen yet. Ancestor's Call and Eureka never really worked. This gives you a good way to play those things. In standard, there isn't a bunch of stuff that I can think of that you want to "cheat" out with this. Maly (obviously) - could make for a really interesting Aggro and/or Combo deck. Turning this into a 4/4 Spirit of the Frog is pretty cute if you're going to go the Maly type of route. The window for this card is wide open. I think it can be a lot of fun. Thank god the old gods are wild only. I kind of like the design and it looks fun, but this just begs to be abused sometime in the next 2 years. I feel uncomfortable knowing that someone is stalking me behind a corner. The effect is weird (in a good way). For now I'm thinking of Deathrattle shaman in wild or Malygos, if you build your deck in a very specific way. I like how cards like this open many deck-building possibilities. Shadow Essence reprint in a different form. Support for Big Shaman. Might work. Not sure about this one. I guess it will need a very specific deck built around it, and I don't quite see how that would work. But I'm sure somebody smarter than me will at least come up with a solid meme deck for the morpher. This reminds me of Barnes. A eureka shaman with this could be pretty crazy. Things like a 4/4 alakir, in which case the attack is even buffed. In wild, I think big shaman can be a real thing.